The report is an unforgiving and but fair critique of the United States’ federal approach to tobacco policy, which we think is an unmitigated regulatory disaster. Whatever the stated intent, the effect is to protect the cigarette trade from competition, damage pro-health American businesses, mislead and harm consumers and add unnecessarily to healthcare costs. Federal agencies are preoccupied with negligible or imaginary risks at the expense of great opportunities to address the health risks to America’s 38 million smokers. Around nine million vapers are already taking action to protect their health, the federal bureaucracy is set to block their efforts. So far smart, self-interested consumers, innovative producers and disruptive technologies have interacted in a lightly regulated free market to begin to tackle the huge burden of disease arising from smoking. That is about to change: the dominant reaction of the federal government is to choke these highly positive developments with huge regulatory burdens, opaque authorization procedures, impossible evidential tests and misinformation about risks. American federal tobacco policy couldn’t be much worse, but it could be a lot better. The fundamental change required is to embrace and maximise the huge opportunity of vapor and other low-risk nicotine products, while keeping a sense of proportion about minor risks. The eight proposals to reshape policy are listed below. The report provides a context, summarises the proposals and provides two pages on each. This is our pitch to the Trump administration and (as yet undecided) incoming FDA Commissioner. We have been necessarily concise and see this as an opening gambit. The full report, summary and report sections are at the links below. The rest of this post is the executive summary. 36.5 million Americans (15% of adults) smoked 264 billion cigarettes in 2015. Cigarette smoking causes more than 480,000 deaths each year in the United States – more than HIV, illicit drugs, alcohol, motor vehicles and guns combined. Smoking-related illness in the United States costs more than $300 billion each year, including nearly $170 billion for direct medical care for adults and more than $156 billion in lost economic productivity . Smoking creates a massive health and economic burden. “Death and disease from tobacco use in the United States is overwhelmingly caused by cigarettes and other burned tobacco products”. Where there is no combustion, as with smokeless tobacco, e-cigarettes or vaping products or heated tobacco products, the risks of nicotine use will inevitably be much lower (20-100 times lower) because the physical processes are so different. None of these products is perfectly safe – very little is. But they are very much safer. U.S. tobacco policy suffers from an ‘abstinence-only’ ideology. This intolerant approach rarely works well in any branch of public health. 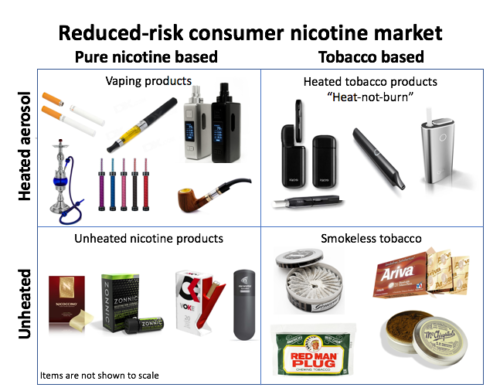 The opportunity is to move to a market-based ‘harm reduction’ approach whereby people who want to use nicotine or are not sufficiently motivated to quit nicotine can use products that are much less harmful than smoking. New regulation coming into effect over the period to August 2019 will have the effect of taking 90-99% of vaping products off the market for bureaucratic rather than safety reasons, and therefore dramatically limit options to switch from high-risk to low-risk products and obstruct innovation. The response to such rules will be to cause harm to people as they return to smoking and harm to American businesses as consumers seek black market supplies from international internet vendors. The American consumer has been systematically misled and denied truthful, non-misleading information about the relative risks of non-combustible products. The system of tobacco science funding in the United States is working to support expansion of federal bureaucracies and an abstinence-only ideology, rather than in the public interest. Concern about children. Much of the rhetoric used by activists and regulators to justify poor or excessive regulation has been based on an emotive appeal to the protection of children. However, the data shows that coinciding with the rise of vapor products there has been a sharp decline in teenage smoking: between 2011 and 2015, current use of cigarettes by high school students fell rapidly from 15.8% to 9.3%, and use of cigars and pipes also fell . Non-smoking high school students are highly unlikely to use e-cigarettes; among those who do, most used them very infrequently . Further, only a small minority of teenage vaping involves nicotine , and much of the use is occasional and experimental rather than an entrenched habit . Bans on sales of vapor products to minors were already in place (48 states) or in progress (2 states) prior to FDA asserting jurisdiction in 2016. It is unlikely that teenagers are harmed by the emergence of products much safer than cigarettes. However, it is likely that both teenagers and adults will be harmed by excessive regulation or de facto prohibition of low-risk products that substitute for smoking. 1. Seize the huge opportunity presented by low-risk nicotine products Revolutionize tobacco and nicotine policy, reduce healthcare spending and improve health by exploiting the very large difference in risk to human health caused by combustible and smoke-free products. Make appointments and provide direction and funding to embed this in federal agencies such as FDA, CDC, NIH and Office of the Surgeon General as well as the highest levels of the Department of Health and Human Services. It requires a concerted approach on many fronts. Put the implementation process on hold and quickly pass legislation that changes the Tobacco Control Act predicate date to 8 August 2016 for nicotine products that do not contain tobacco. Replace the costly, opaque and politicized product-by-product authorization regime with a standards-based regime where it is clear what is required of manufacturers (recommendation 3). Add a range of interim safeguards concerning common ground issues such as battery and fluid safety if a standards regime will take time to agree. These should be applied by Congress in the instrument it uses to affect the changes above. 3. Establish a standards-based regime for low-risk nicotine products Regulate low risk tobacco and nicotine products by setting product standards (chemical, mechanical, thermal, electrical) that reduce individual risk to users while promoting innovation and ensuring the products are an attractive alternative to smoking. These standards would ensure average exposures were at least 90 percent lower than smoking and would make a further public health benefit test unnecessary. 4. Use new labels to inform consumers about relative risk. Using its rulemaking powers, FDA should allow manufacturers to apply an accurate ‘harm reduction’ message to all non-combustible tobacco or nicotine products: “This product presents substantially lower risks to health than cigarettes” or other truthful, non-misleading communications. 5. Stop using the public health test to protect the cigarette trade The public health test in the Tobacco Control Act does not protect the public health, but it does protect the cigarette trade from competition. It should not be applied to non-combustible tobacco or nicotine products. These should be evaluated according to their product characteristics and risk to individual users, not unknowable post-market population effects. 6. Restore honesty and candor to public health campaigns Require FDA, CDC and other relevant federal agencies to act to bring public perceptions closer to reality, for example to set a goal that by 2020 at least 75% of Americans believe that e-cigarettes, smokeless tobacco and heated tobacco products are, correctly, each ‘very much less harmful’ than cigarettes. This could be realized through enabling language and funding included in the President’s Budget Proposal or by Executive Order. 7. Refocus tobacco science on the public interest not bureaucratic expansion Overall, the imperative is to change the incentive structures in tobacco-related research to stress objectivity in the public interest, not to justify expanded bureaucratic intervention. Encourage establishment of a “Center for Nicotine and Tobacco Science in the Public Interest” to act as a defender of the public interest. 8. Challenge vapor and smokeless prohibitions under WTO rules The United States should initiate complaints under World Trade Organization agreements about wholly unjustified prohibitions of low-risk nicotine products in jurisdictions outside the United States. This would give a win-win for public health and American exporters, while challenging the negligence of the World Health Organization and some of its member states. Miech R, Patrick ME, O’Malley PM, Johnston LD. What are kids vaping? Results from a national survey of US adolescents. Tob Control. ; 2016 [link]. Well, we can only hope Trump and his administration take heed and act in a sensible way in response to this. Not holding my breath, though, as the first 100 days don’t indicate that there is much reason for optimism. This should be implemented by Executive Order immediately. If the new Administration wants to save untold lives and further Public Health over the unabashed greed of Big Tobacco and Big Pharma, this is certainly the opportunity to do so. Around nine million vapers are already making taking action to protect their health. Around nine million vapers are already taking action to protect their health. Feel free to delete this comment once seen.